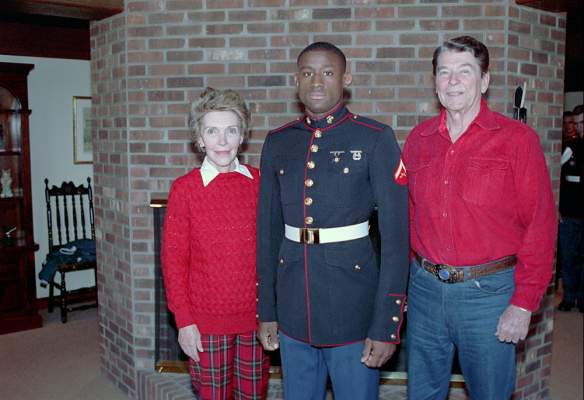 Manuel W. Lloyd a USMC Veteran (4 years) with 20+ years of IT Industry & Business Experience. Since 1992, Manuel W. Lloyd has provide thought leadership, business insights and leading edge thinking to companies such as Emergency Management Division Camp LeJeune, IBM Global Services, Lucent Technologies, Coke, HP, Honeywell, GE Equity, AutoZone Corporate, and others across the globe. 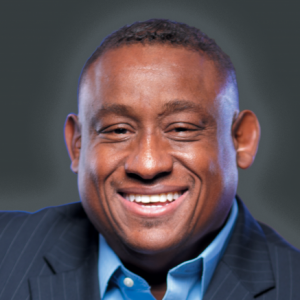 Manuel W. Lloyd is the inventor of GECaBi®, a fast, lean, agile, secure, and hybrid neo-design platform of computer hardware, integrated circuits, communications hardware & software, software protocols, and computer networks for Government, Education, Consumer, and Business integration. GECaBi® identifies and solves the most critical IT Infrastructure, Connectivity, Mobility, Performance, Reliability, Business Continuity, and Security problems by using patent-pending technology involving the integration of government, education, consumer, and business networks. 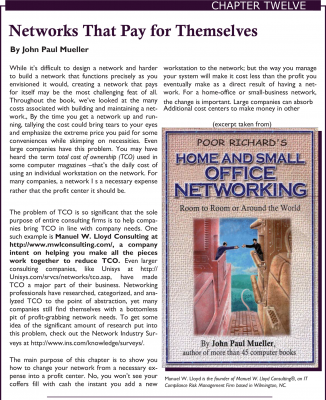 "Manny is often our go-to resource for IT channel and business expertise. Whether he is serving as an expert source for an article or on stage at one of our live events, we know that he will deliver expert opinion in an engaging, entertaining and a thoroughly credible way. Manny makes our job easy!" “I have known Manuel W. Lloyd for almost twenty years and have used him as a Technology counselor, for all of those years. My company has always found itself ahead of the curve and ahead of my competitors with Manuel’s guidance and recommendations. I have found them to have the highest regard for integrity, ethical dealings, and morality. I highly recommend Manny as an associate or business partner. His company is very capable and highly knowledgeable. They provide expert advice, risk management and planning, they manage the IT needs of our staff, they secure our systems 24x7x365, & provide mitigation in all other areas of our critical IT needs. My business has over 300 computers in operation at any given time, day or night and weekends and Manuel W. Lloyd Consulting® keeps it running. Manuel "Manny" is a rare individual and I, having had dealings with him, his wife of 20 years, their 8 beautiful children, and his company for some 20 years, without hesitation, highly recommend them." We all know margins in the cloud can be thin, but that doesn't mean there isn't serious money to be made selling cloud services. 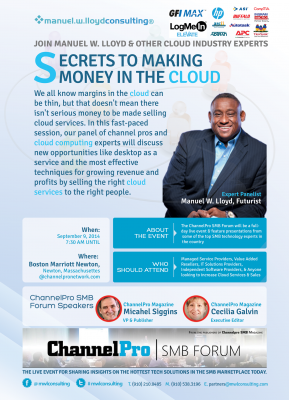 In this fast-paced session, our panel of channel pros and cloud computing experts will discuss new opportunities like desktop as a service and the most effective techniques for growing revenue and profits by selling the right cloud services to the right people. As a model of computing, the cloud certainly promises a lot of benefits that are hard to beat. Fast and easy deployment of applications, reduced capital expenses, and payment based on usage are among the top reasons proponents say that cloud services will transform the IT industry. Yet there are still channel partners that aren't buying the cloud's positive message. For many of these partners, the cloud represents yet another competitor that threatens to erode their margins and lure away long-standing clients. To counter the cloud's considerable pull, channel partners should not bury their heads in the sand or deny that the cloud has any merits outright. 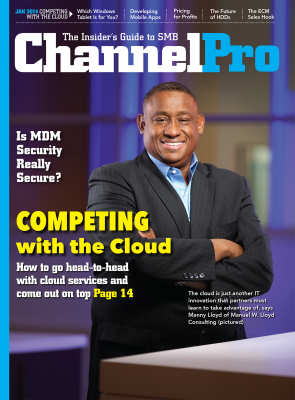 Instead, channel partners need to play to their strengths to effectively go head-to-head against cloud services. Cementing personal relationships with clients, emphasizing a client's individual business needs, and yes, even offering up cloud services via a hybrid model, can enable channel partners to profitably coexist alongside cloud service providers. Smartphones have long been left out of the remote control support space, but LogMeIn recently unveiled a way to troubleshoot and diagnose device problems remotely. Whether you're an outsourced IT provider, part of an in-house IT staff, or are a software vendor that needs to support your product remotely, you'll leave with business building tips that help drive profits. This free, interactive PCMagCast will include audience Q&A – so join us for the live broadcast for an opportunity to get your most pressing questions answered. 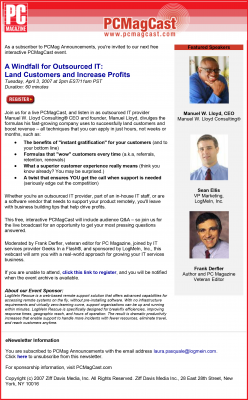 Moderated by Frank Derfler, veteran editor for PC Magazine, joined by IT services provider Geeks In a Flash®, and sponsored by LogMeIn, Inc., this webcast will arm you with a real-world approach for growing your IT services business. Best-practices advice on creating, maintaining, and deepening mutually beneficial relationships with other IT Pros By Carolyn Heinze. For organizations needing to achieve IT compliance and governance under Sarbanes-Oxley (Sarbox), Gramm-Leach-Billey (GLBA) and The New Capital Accord (Basel II), Federal Food & Drug 21-CFR-11(21-CFR-11), Payment Card Industry Data Security Standard (PCI-DSS), Notification of Risk to Personal Data Act (NORPDA – US 2003), European Data Protection Directive (EUDP), The Health Information Portability & Accountability Act (HIPAA), Personal Information Protection & Electronic Documents Act (PIPEDA). GECaBi® is a fast, lean, agile, secure, and hybrid anti-breachware neo-design platform of computer hardware, integrated circuits, communications hardware & software, software protocols, and computer networks for Government, Education, Consumer, and Business integration.